The particular ‘ Englishman ‘ (aka Charles Arnold-Baker) was a remarkable polymath: an academic, author, broadcaster, a professor of law and architecture who singlehandedly wrote and published a work of reference of monumental proportions. The Third Edition of The Companion to British History** is a tour de force, an epic undertaking which runs to more than 1400 pages. So what on earth has this remarkable character got to do with Hook Heath - and specifically Allen House Park? Well, it most certainly had a major influence in shaping his character and stimulating his intellectual prowess at a very young age since he was a pupil at Allen House preparatory school which occupied the area now known as Allen House Park. 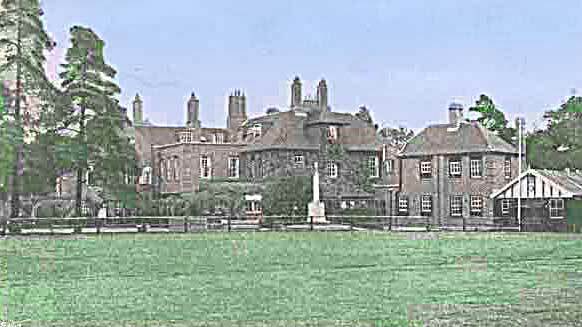 Allen House, founded in 1871, was located first at Box Grove near Guildford and subsequently on part of the site occupied by the Royal Grammar School on Guildford High Street. You can still see references to Allen House on signposts in Guildford. Hook Heath was the location chosen for the purpose-built school which was established in 1912 and was owned, from the outbreak of World War II by the Archibald family until its closure in 1986. It was recognised as “ efficient” by the Ministry of Education in 1947 at a time when boarding fees were 55 guineas per term. Over that period the sons of many Hook Heath residents - including our own - were educated at the school. The site was sold to the McAlpine building group which built the 49 houses and apartments on what is now Allen House Park. The school merged with St Michael’s School in Old Woking and became the successful Hoe Bridge School. By 1931, von Blumenthal ( “to my great surprise”) had been appointed as Head Boy and became the first Allen House pupil to sit - and pass - the entrance examination for Winchester College where he began his studies in 1932. A truly remarkable individual whose scholarship owes much to his formative early years and his education in Hook Heath. *For He is an Englishman, Memoirs of a Prussian Nobleman, by Charles Arnold Baker, Jeremy Mills Publishing Limited 2007.ISBN 978-1-905217-44-1.